Ventura, the city of San Buenaventura, sits in the County Seat of Ventura County in California, USA. According to the census in 2010, it has a population of 106,433. Population wise, it is ranked 58th in the whole of California. The city can be entered from four different routes: U.S. Route 33, State Route 101, State Route 118, and State Route 126. 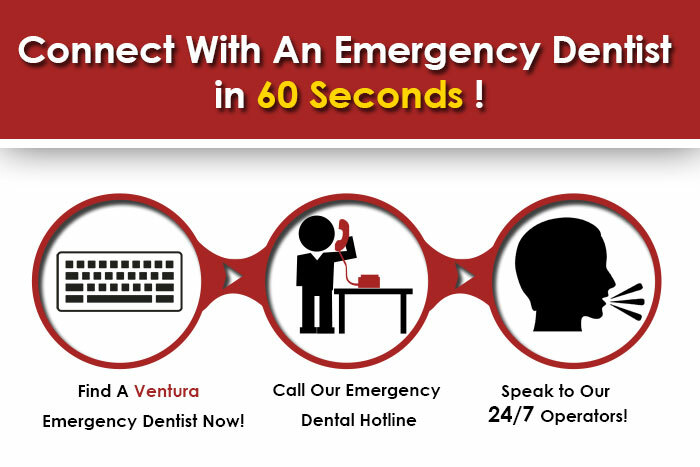 There are many facilities for the citizens of Ventura, and one of them is a diversity of emergency dentists and clinics. Emergency dentists may seem to be an unnecessary addition to the city facilities if you have never suffered from a sudden tooth-crisis. In these emergency dental clinics, the dentists are always highly trained and experienced in detecting and solving the root of the problem. You may have a loose tooth that has finally started to bother you, or sudden bleeding gums, toothache, chipped tooth, knocked out tooth and a million of other kind of oral problems. Most people don’t bother going to a dentist for regular check-ups or examinations. So it happens too often that you or someone around you has come down with a sudden uneasiness about their teeth or gums, which is keeping all their attention on their oral problem and are unable to concentrate on anything else. In these cases, when emergency help is required, you can be thankful to the heavens for these emergency dentists. They are all usually highly trained and just a call away. So do not hesitate to call them. They can be trusted and they will be able to give you a proper solution for your dental issue. The Ventura dental health center is operated by three renowned dentists who have manyyears’worth of experience. Together, they can solve almost any kind of problem you might be having. The dental treatments they offer are fillings, dental sealants, dentures, dental implants, bridges, crowns, tooth extractions, non-surgical root canal, bonding, TMJ treatment, and cosmetic treatments. Call them at any time at805-653-5606, or visit their clinic at 2807 Loma Vista Road, Suite 201 Ventura, CA 93003. Hillview Dentistry has a whole other sector devoted to emergency calls, where you can call to set instant appointments, and thus, get instant relief from your suffering. They can help with all sorts of emergency cases, due to the experience their doctors have gained since 1992. It is a family dentistry, which makes it a one-stop solution for all your oral problems. Call (805)250-6825 or visit them at 3555 Loma Vista Ventura, CA 93003. Plaza Dental is also a family dental care where you can take your kids and grandparents alike. They offer personalized care for emergency patients under these categories: invisalign, teeth whitening, sedation dentistry, veneers, bonding, cosmetic dental care, etc. Call at 805-653-0620 or visit at 4744 Telephone Road, Suite 4 Ventura, CA 93003.